As the winter draws closer, it is time to start thinking about feeding birds during the cold winter months. 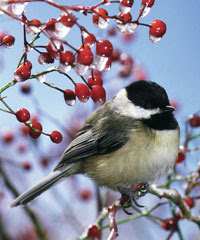 As natural food sources are low in the winter, birds benefit greatly from you putting food out in the garden. Foods with a high fat content will help to give the birds extra energy. Sunflower seeds, peanuts, dried fruit and suet are all fat rich foods and will give the wild birds that extra energy boost. If you have a fruit tree in your garden try and leave some of the ripe fruit under the tree so that thrushes, blackbirds and starlings can enjoy a high energy treat! Don`t forget that birds still like to bathe and drink during the winter, so if possible top up water areas.